Simone Bodmer-Turner is our current ceramic artist-in-residence for the year at Saipua. Simone is focused on ancient hand-building techniques and forms from traditional pottery communities around the world. She creates her vessels exclusively out of coils and slabs - a method that developed more fully during her residency in Japan. Simone perfects each form by burnishing it with pieces of jicara gourd - a traditional method used in Mexico and many South American communities that she learned while working with a group of women potters outside Oaxaca. Through the study of ancient technique, those familiar forms have also made their way into her work, but are often made more modern as she is also very inspired by the curvy minimalism of midcentury sculptor and potters. Texture and smoothness hold equal weight for her, which has developed into two divergent bodies of work - one rough and crude, finished with blistered crater and lichen glazes, the other burnished and smooth, often finished in matte white to highlight the dramatic curves so difficult to achieve without a wheel. During her residency at Saipua, she intends to continue to explore these two different, but parallel, bodies of vessels that pair so interestingly together. She is currently intensely interested in glaze chemistry and playing with the components to achieve more complex surfaces, something that she hopes to expand and perfect during her time at Saipua. From the time she met Sarah, she has been exposed to the ways flora interact with a vessel, and the way weight and form dictate what can be put in them. 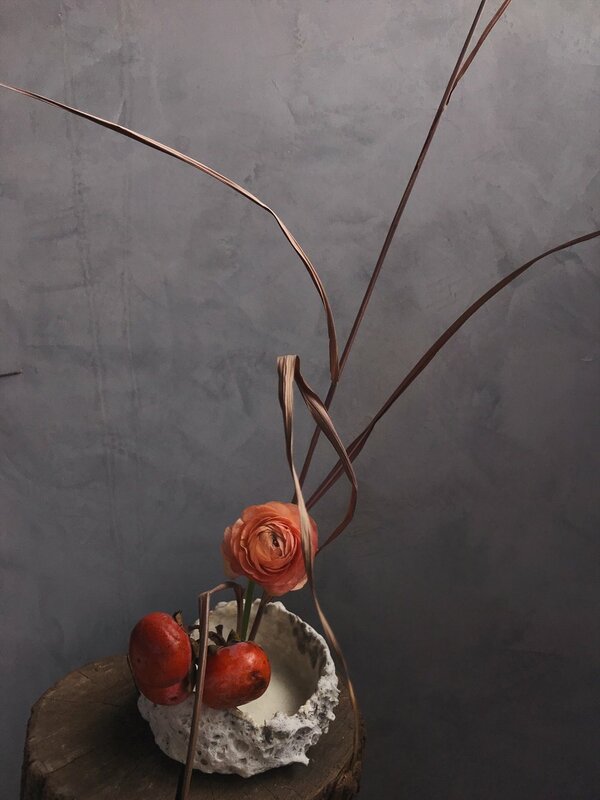 The two have been working on vessels that are intended for certain arrangements - a heavy pear branch, a long spindly (but ill balanced) vine, etc - and designing pieces that overcome the setbacks a florist might encounter when trying to create an arrangement within a vessel.